Can’t make it to a face-to-face workshop or do you prefer to do your learning online? 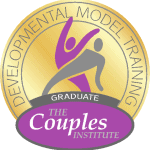 Our e-courses share the information, tools, and tips to pump up your relationship skills. You can go at your own pace and focus your learning where it can guide you the best. Our E-courses are under construction. Check back with us soon! or for more information, please call today. You don’t need to face your relationship, intimacy, or sexuality difficulties alone. I invite you to take charge of your life and ease your pain by exploring relationship and sexuality counseling services with me. We usually know how to help clients through a break up, divorce, or loss of a partner, but what about when they are ready to date again? Complex issues like lack of dating skills, attitudes of their minor or adult children, as well as thorny questions about sexuality will emerge. Sometimes therapists’ own attitudes and values interfere with good practice, for example, with older clients. Are you ready for resources and updates to take your practice to the next level? When you sign up I will send you practical dating skills tips for clinicians to use with your clients now. Your privacy is important to us. We don't sell, trade, or share your information with third parties. Who is your couples therapist? Get Your Copy of "Dating Skills Tips for Clinicians" that you can use with your clients.